Naxos is not only the largest, but also the lushest and most varied Cycladic Island. It has the most beautiful beaches in the whole of Greece, some of them stretching for kilometres on end with the finest white sand – and on top of that hinterland with plenty of things to discover. Due to the proximity to the neighbouring island of Paros, the narrow strait along the west coast produces strong winds, just perfect for wind-surfers and kite-surfers who have chosen Naxos as their favourite amongst the Cycladic Islands for that reason. Their relaxed life-style has shaped many of the south-western coastal resorts and hotels. But away from beach-life many villages inland have kept their Greek authenticity and a very individual island culture. Fertile planes, picturesque hilly regions and rough mountain ridges dominate the scene, randomly scattered amongst them historic places and excavation sites of statues and temples reminding of the events described in Greek mythological stories. Relevant to Naxos is the one where Theseus abandons Ariadne on Naxos, although it was she who helped him escape from the Cretan labyrinth after killing the Minotaur. In ancient times, Naxos was a cultural centre within the Byzantine Empire and famous for its coarse-grained marble. It is still quarried today and is mainly used for sculptures. The celebrated panorama of the island can be admired from the highest elevation of the Cyclades, Mount Zeus, rising to 1000 metres above sea-level. Those who are prepared to venture the steep 2-hour-ascent will be rewarded with a singular view across the Cycladic Archipelago and can enjoy the Meltemi, the midday wind. During the off-season, a growing number of hiking tourists visit Naxos, which has led to the development of a remarkable network of hiking trails with sign-posts connecting villages, monasteries and sights on the Greek island. Due to the fertile soil and more abundant water resources than on other Cycladic Islands, Naxos has agriculture on a reasonably large scale – probably one of the reasons why Naxos has become famous for its outstanding island cuisine. Culinary skills and good food are very important to the inhabitants of Naxos and are reflected in many regional specialties. There are, for instance, special types of cheese, olives, wine, special vegetable-, lamb- and goat dishes – and the particularly tasty potatoes that are famous throughout Greece and should be sampled by all visitors to Naxos. The returns of mining and the produce of the fertile planes must be the reason why it wasn’t sooner that tourism started playing a significant part in the economy of Naxos. Unlike the inhabitants of many of the smaller and less fertile Cycladic Islands, people on Naxos had always had other sources of income. One positive effect of this development is the original authenticity of island life that visitors to Naxos can experience. Those who travel by ferry from Piraeus to Naxos, arrive in the harbour of Chora and can instantly immerse themselves in the colourful activities on the picturesque promenade along the harbour of the island’s capital. Towering above the nice little town is the Castron, remnants of a fortress built by the Venetians who ruled over Naxos once upon a time. Apart from that, there is anything you might possibly want on Naxos, from a variety of restaurant offers to book stores and specialty shops. A small museum on the Kastron recounts the island’s history and during the summer months, exquisite little concerts are performed above the rooftops of the town. Those who want to explore the island on their own, should rent a car and prepare themselves for driving on steep roads and serpentines. In the southern and eastern part of the island your route takes you through some deserted beach regions along sand tracks and gravel roads, but rewards you with truly fantastic scenery and solitary bays. One of the regular visitors to Naxos tried to put into words what makes him come back year after year: “Once you have caught the Naxos bug, you will never get rid of it again.” Due to the considerable size of the island there are always deserted beaches to be found, even during the peak season when the neighbouring islands of Mykonos and Paros are heaving with tourists. The island has its own little airport as well, and the flight to Athens only takes a few minutes. When a plane approaches, the coastal road is simply closed by application of the only set of traffic lights on the island, and landing respectively take-off can take their course, watched at close range by the other users of the road. The Agia Anna Beach and the resort of the same name are situated in the south of the Cyclades Island of Naxos. Agia Anna is quite a touristy place with a lot of accommodation options. The little church of Agia Anna that gave the resort its name is on the coastal road. Many sailing yachts and other boats anchor here and enjoy the big variety of taverns and restaurants that are all located on the beach and afford a beautiful view of the glittering, turquoise Aegean. There are no historic sights, and Agia Anna has no old town centre, as it only grew within the last decades. What the resort does have to offer, are beach-related activities, water sports and gastronomic specialties. The resort of Agios Prokopios is situated right next to the award-winning beach of the same name. The water is a clear turquoise colour and the beach has fine, golden sand. Not surprisingly, Agios Prokopios is the most popular and also most populated beach of the Cyclades Island of Naxos. The island’s capital Naxos Town is only about 5 kilometres away and provides a regular bus service to the beach. The Meltemi wind that affects many of the other beautiful beaches has little influence on Agios Prokopios, due to its sheltered position. Some parts of the beach are managed and offer sunshades and deckchairs for hire, others have been left undisturbed and natural, but there is no protection from the sun either. Behind the beach are three salt lakes that dry up during the hot summer months. Those who want a quiet holiday in Agios Prokopios have to come before or after the peak season, but during the peak season the beach is busy with families and small children playing in the shallow water. Water sports for adults include surfing and scuba-diving, and there is a special point of interest in the shape of a wreck that divers can explore. Situated in the highest part of Naxos, Apiranthos used to be the centre of the mining business of the Cyclades Island. Surrounded by marble quarries and mineral mines, the village became quite affluent over the centuries, and its wealth is reflected in the Venetian splendour of many buildings. Several Cretan families settled in Apiranthos during the Ottoman occupation in the 17th century and their cultural and culinary influence is still present in their descendants’ dialect, stubborn views and traditional recipes. In the 20th century the population of Apiranthos started shrinking and many young people left to try their luck somewhere else. This tendency is counteracted by the development of a viable tourist infrastructure: Apiranthos has many small local history museums, cafes, taverns, holiday villas - and a stunning sunset. Apollonas is the only beach resort in the northernmost part of Naxos. In the summer many Athenians arrive for their holiday, and ex-citizens of Naxos come to visit. For international tourist, there is a special attraction in Apollonas; it is the unfinished statue of a youth or “Kouros”, 2500 years old (some youth!) and 10.5 meters tall. Apollonas has a group of regulars who return to the island year after year: it is called “Apollonakis” and consists of people who enjoy traditional Greek life-style. The pretty little town is located 10 miles from Naxos Town in the central plateau of Tragea. Chalki, at one point even the capital of the island of Naxos, has become one of the most popular destinations for excursions on the island, but has not lost its authentic character and its serene atmosphere. In terms of accommodation there isn’t very much. The houses are mainly built in Venetian style, some of them lovingly restored, others slowly crumbling away which gives the town a certain charm. A Naxos specialty is Kitro, a lemon liqueur, and the distillery is open to the public to visit. Chalki has charming squares with traditional taverns where you can sit in the shade and chat, or have a meal. There are numerous souvenir shops with Greek style blouses, ceramics, jewellery, olive oil etc. For those who want to know where the oil comes from, there are olive groves to admire, with their bizarre branches that look like ancient snakes and trunks that look like elephant skin. The small village of Mikri Viglia on Naxos used to be mainly popular with surfers. In recent years it has been extended into the hills and there are many accommodation options now, from cheap private rooms to luxurious holiday villas. Nevertheless it is fairly quiet even in the peak season, much less busy than the more northerly coastal resorts such as Agia Anna or Chora. Mikri Viglia Beach is wide and without any shade; it has crystal clear water and very fine sand. Outside campsites camping is prohibited, but here and there you come across the occasional caravan amongst the dunes. The beach of Mikri Viglia is divided into a northern part and a southern part by a rocky cape. The northern half is more exposed and ideal for surfing and kite-surfing. The southern part is nicknamed “Sahara Beach” and is popular with nudists. Moutsouna is a quiet harbour resort in the most remote part of the island of Naxos. It used to be something like an industrial port, from where the Naxos marble was shipped to Athens and other Cyclades Islands, or in modern times it was emery mined in the mountains. The steel ropes of the funicular and the dilapidated office of the mining company are still there. Moutsouna and the southern part of the east coast of Naxos are ideal for those who like to explore, discover lonely little bays and enjoy complete solitude. Moutsouna has some pretty taverns with a wonderful view of the neighbouring archipelago of the “Little Cyclades”. Accommodation is limited but has been improved in recent years. Chora (Naxos Town) is the capital and the port of the island of Naxos – a lively little Cyclades town with an interesting historic background. In the summer months the lanes are bustling, in contrast to the rest of the year where just under 7000 inhabitants of the Chora lead the quiet life they are used to. In the peak season, ferries and speed boats arrive from Piraeus and the surrounding islands several times a day. If you approach Naxos from the sea, you will see the impressive landmark of the island in the shape of a gigantic stone gate on the nearby island of Palatia. It is part of an Apollo temple that was never completed, the gateway of which has defied the passing centuries. There is a little causeway leading from the harbour across to the island, a memorable early evening walk in an almost magical atmosphere. Those who come to see the excavations during the day can go for a swim right where they are, or have a rest at the café. Only a few hundred yards to the right of the harbour is the Protopapdaki, the marble marina, leading to the centre of activity of Naxos Town. There is a large number of taverns, but to find the best ones, watch where the natives go. Behind the marina there are two historic quarters of Chora: the lower part (Bourgous) was where, under Venetian rule, the Greeks used to live; higher up on the Kastro lived the Venetian rulers and their servants. In the 13th century no less than 12 towers protected the fortress against attackers, nowadays there is only one left. The modern part of the town is called Agios Georgias and this is where most types of tourist accommodation can be found, mainly guesthouses, but also an increasing number of hotels. Ornos and Ornos beach are situated in the southwest of Naxos. The beach is a favourite with kite surfers, because the wind conditions are almost always perfect. The main beach has soft white sand and dunes, but there are also many small bays with either sand or rocks. On the main beach you can hire surf equipment, and there are some taverns and cafes as well. 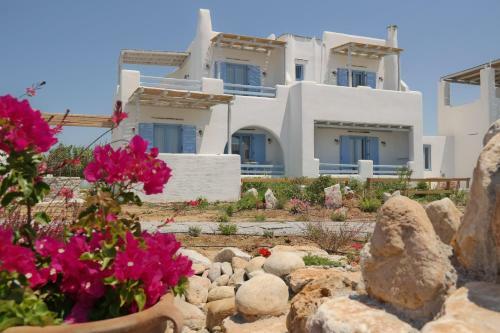 This part of Naxos also has some new accommodation options in the shape of apartment complexes that are very popular with kite surfers; for more demanding holiday-makers there are holiday villas and small hotels with a spectacular view of the island of Paros. The village of Sangri consists of two parts which makes it seem like two villages: Epano Sangri and the slightly smaller Kato Sangri. Epano Sangri is famous for its Byzantine monastery, one of the oldest monasteries on Naxos, while Kato Sangri is the location of the most interesting archaeological excavation site on the island. It is a temple dedicated to the fertility goddess Demeter, who has always been worshipped by the rural community of Naxos. Dating back to 530 BC, the sanctuary was discovered by archaeologists in 1949. As a joint project between the universities of Munich and Athens, almost the entire temple precinct was reconstructed, and the result conveys a comprehensive impression of the temple’s dimensions and life on Naxos in ancient times. Admission is free, but those who want to see the temple have to bear in mind that all Greek museums are closed on Mondays. If you decide to walk there, take some water in case you get lost, but there is also a regular bus service from the capital.